Since 1985, Jordans has worked with British farmers to dedicate land for nature and wildlife creating a huge nature reserve to help birds, bees and butterflies thrive. We work with wildlife experts and The Prince's Countryside Fund to help our farmers manage 10% of their land for wildlife and provide funding to support rural communities. So, by picking Jordans cereal bars you are helping our British farmers protect the countryside and look after the communities that make it so special. At Jordans, we believe in keeping things simple. 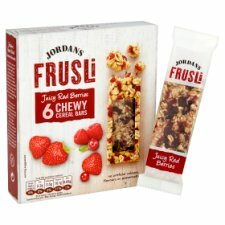 These tasty Frusli bars are a combination of juicy of red berries and British wholegrain oats, packed into a scrumptious chewy bar. No baking, just delicious ingredients to tempt your taste buds. At Jordans, we use British wholegrain cereals and keep processing to an absolute minimum. Salt is never added and we're committed to reducing sugar and fat levels ongoing without compromising on great taste. What's more, we use only natural ingredients where we can. 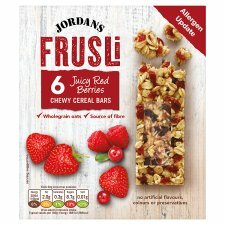 You'll never find artificial colours, flavourings or preservatives in any Jordans products, nor do we ever add sulphur dioxide as a preservative for our cereal bars, so you can enjoy every deliciously chewy mouthful! To keep these bars nice and fresh, store in a cool, dry place and close box after opening. If you are unhappy with any Jordans product, get in touch and we'll do whatever we can to help. (Postage necessary outside the UK).